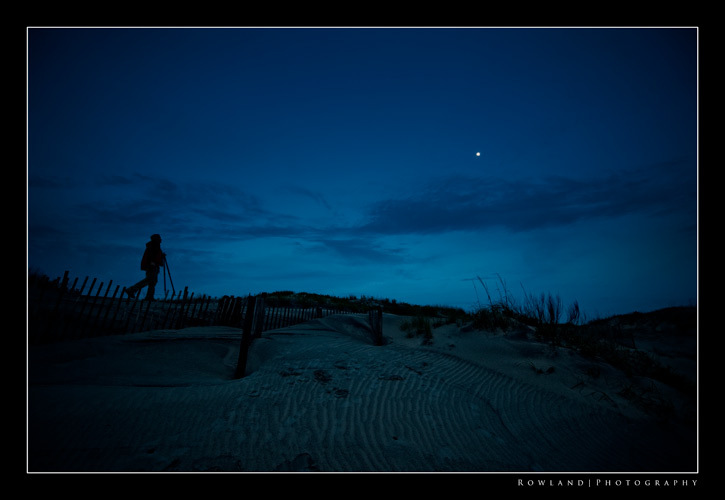 Just a quick snap taken will I was in the Outer Banks… another photographer setting up to shoot the moon high in the sky over the dunes. 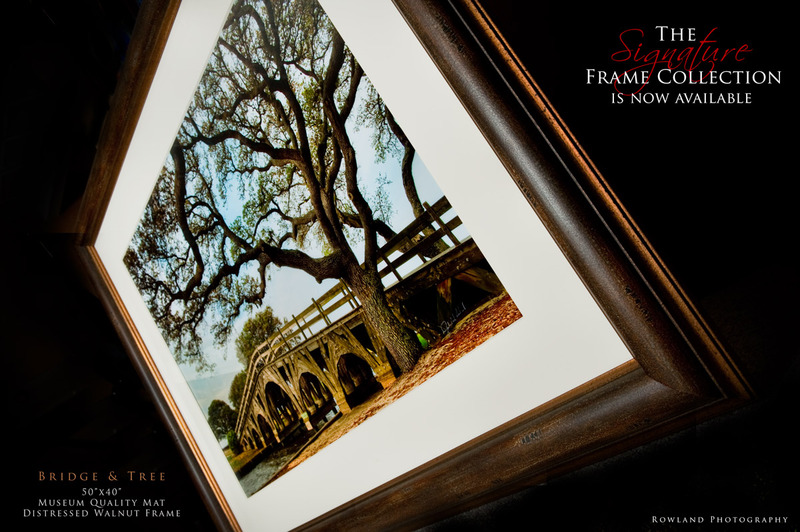 Great colors… great memory, captured forever in this frame. 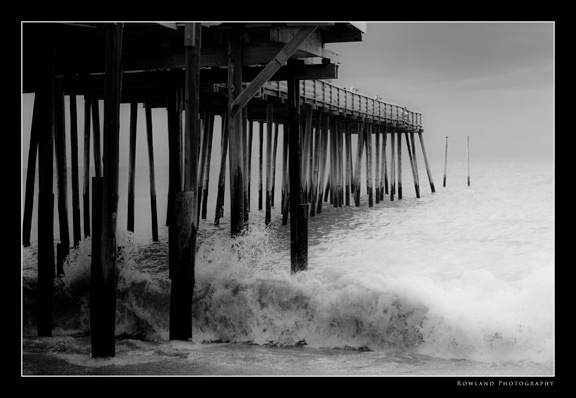 I’ve posted shots of this pier from Duck in the Outer Banks before… but this one had a twist… didn’t notice that little guy flying through my frame without my permission (I might add 🙂 but I loved him in there. Added a little sense of life to the otherwise quiet solitude. It’s a shame this images get “shrunky-dunked” to fit the blog space, it’s neat when you see it bigger. 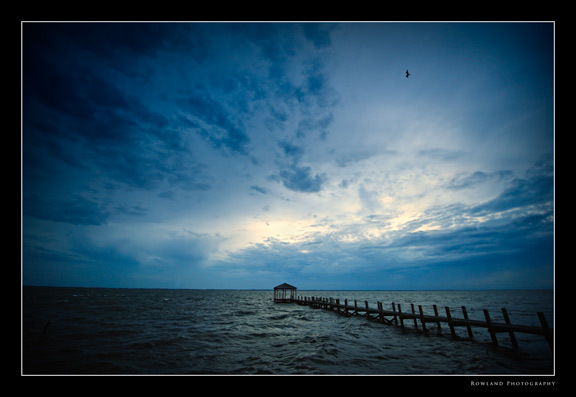 This was shot in the town of Duck, in the Outerbanks. Big storm had just blown through (actually washed out our evening shoot at Jockey Ridge) so the sky was full of sullen storm clouds. 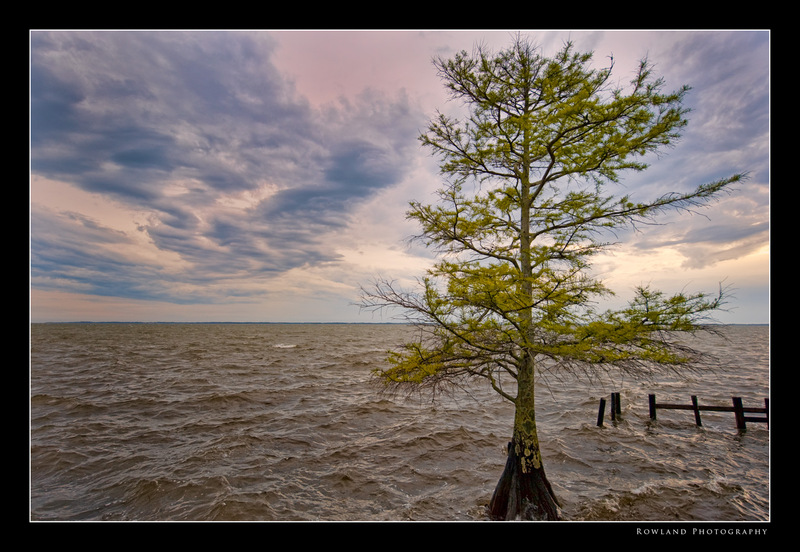 I was amazed to see these trees in the water on the “bay” side of Duck. Had never seen this before, where trees this big lived in such salty, brackish water. And more amazing, they were growing right behind a little strip mall. You had to get out and walk behind the buildings to see them. Turned out to be a hidden treasure for shooting. As a photographer (and most of the ones I know) my eye is drawn to color and texture. Can’t seem to help it. This is a shot from the side of an old building in Wanchese Harbor in the Outerbanks. I think there was more vine than building actually. It had fallen into grave disrepair and nature was in the process of reclaiming her territory, one leaf at a time. Loved the bright green leaves against the rusting cracked wood, and peeling paint. You can feel the texture, the age of the building, and the hopeful promise of these leaves. Just a neat little detail shot, but it has a lot of character. Enjoy! From a little research (thanks Google!) this house in the Currituck Heritage Park in the Outer Banks is named the Whalehouse. It was built between 1922 and 1925 and is 21,000 square feet. The family that built it (the Knights) seemed to have lost interest in it and it remained unoccupied for many years. In 1969 it was sold for, get this, $25,000. The house suffered significant vandalism and deterioration as it remained vacant for years to come. Finally it was added to the National Register of Historic Places and restored in 1999 (at the cost of a few million bucks). With all that history, there is something about this place. Maybe it recalls a distant time in our history, a time when grandeur and simplicity seemed to reign (or at least the romantic in me would like to believe that). I love its canary yellow exterior, and the roof tiles, and the lines of the exterior windows. The day this was taken, the sky was really blown out. Sun was high and really bright, not ideal conditions at all for making a nice photograph. Swiched to HDR mode and did a 5 frame bracket, in retrospect I should have done 7 frames with an emphasis on the highlights as the sky to me was a bit difficult in post to pull back, but I think this image works… I debated removing the colorful sun-flare that my lens caused, but decided that it really added another dimension to this photo. One of the great things about photographing landscapes is you really do see some majestic scenes that stick with you for awhile (or a lifetime). 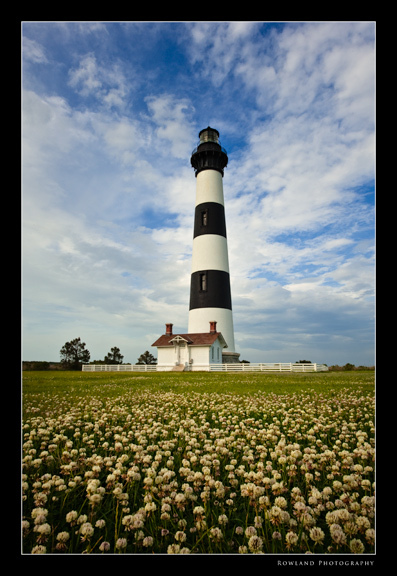 This is from the park at the Currituck Lighthouse. I posted a shot from the other side of the bridge awhile back and its been a favorite of mine, as is this one, which I recently found as I was reviewing the shots from OBX. Anyway, this inlet area off the bay is just incredible- the bridge looks like something out of the Hobbit as do the trees on both sides of it. I was half expecting Bilbo Baggins to come floating in and greet me. Just a real neat spot, that makes for beautiful photographs, from any angle. I plan on printing this one, BIG, this weekend for the portfolio… Can’t wait to see it and touch it on semi-gloss paper. Enjoy & have a terrific weekend!